I’m on a count down to the 4th of July! It is one of our favorite holidays and we love to create, bake and decorate for it! Today I am excited to share a really fun and simple food idea with you. 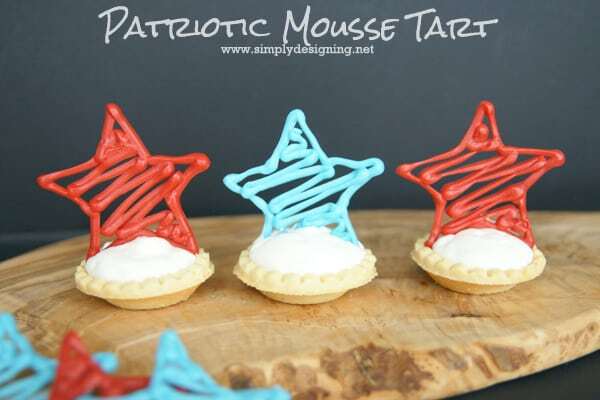 These are perfect for the 4th of July or any patriotic celebration! 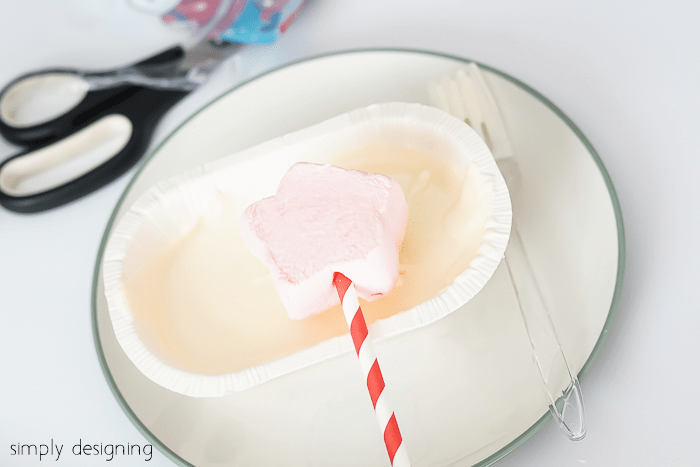 I am going to show you how fun and simple it is to make Star Marshmallow Pops! Yum! These not only taste yummy but they look super cute too! And it is a great food treat to have your kids help you make too! 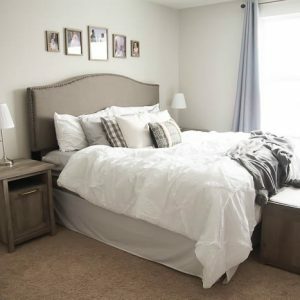 Aren’t these adorable!? They are tasty too! First you will melt your chocolate. 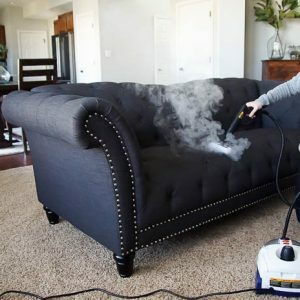 There are several ways to do this, but I prefer the microwave. Although the microwave is arguably the most difficult way to melt chocolate, it is also the fastest! I like to microwave my chocolate wafers on 40% power for 20 seconds at a time stirring in between until the are melted. But you can see all my tips and tricks for melting chocolate here if you have trouble with it like I used to. I hate the clean-up of melted chocolate so I like to use disposable silverware to stir it with and a disposable chocolate melting paper bowl to melt it in. But that is personal preference and not at all necessary. Anyway, once your chocolate is melted, stick a straw into the bottom of each marshmallow star and carefully dip just the front side of the marshmallow into the chocolate. Lightly tap to allow excess chocolate to drip off. Place on a piece of wax paper and add sprinkles. 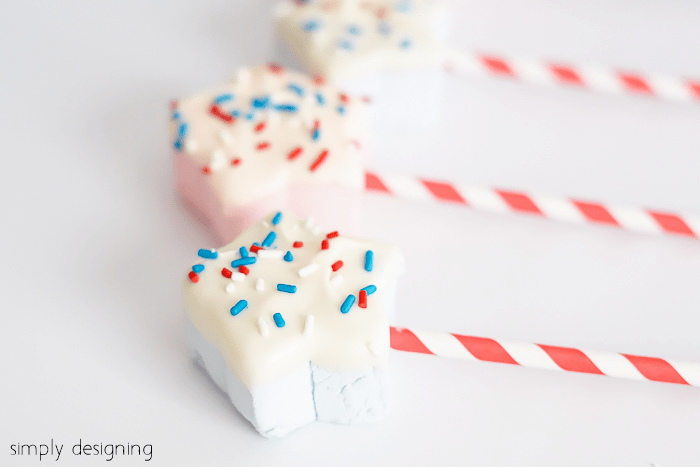 Allow these star marshmallow pops to set for several hours before moving or eating. Once they are set they are ready to eat! I love how perfectly festive these are! 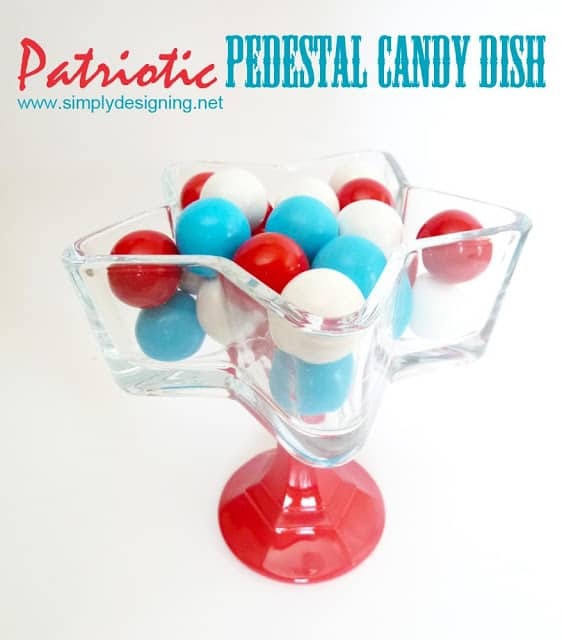 They would be perfect for the 4th of July or for any patriotic celebration like Memorial Day, Veteran’s Day or even all summer long! These are kid and adult approved…let’s not talk about how many of these the kids and I “taste tested.” They passed and are delicious and oh-so cute! Those are very cute. I haven’t seen those candy melts before. Can you buy them at a grocery store? 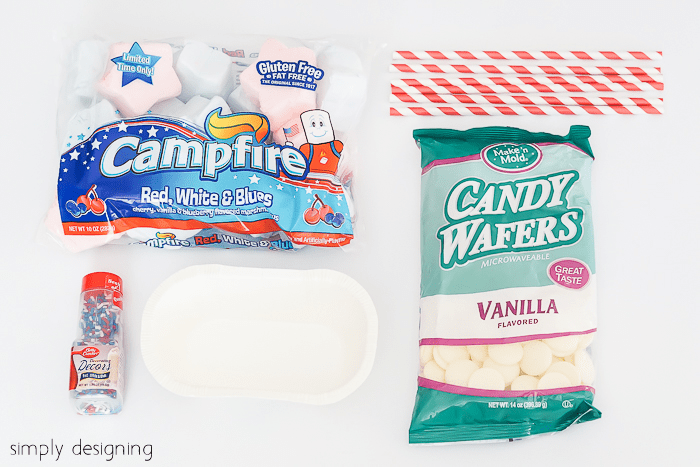 These would be so much fun for any party (not surprisingly we don’t do 4th July stuff here in the UK!) 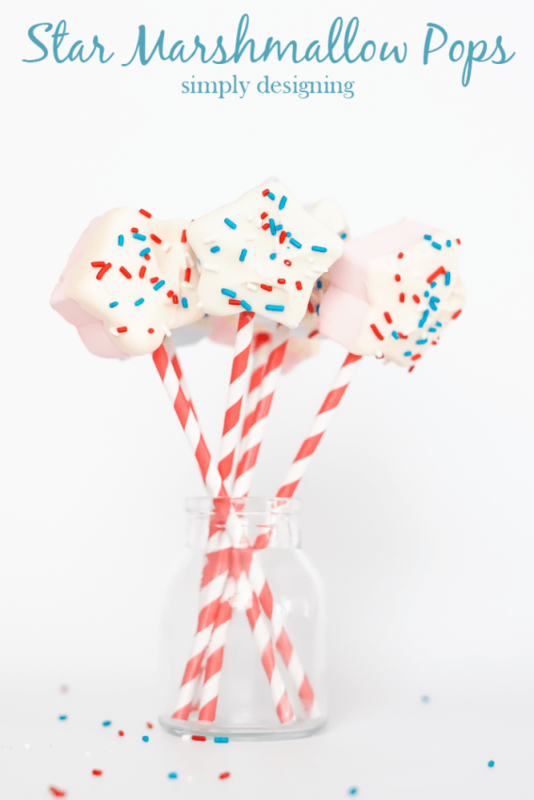 we all love marshmallows in our house and these would make the party table look great without too much time and effort. 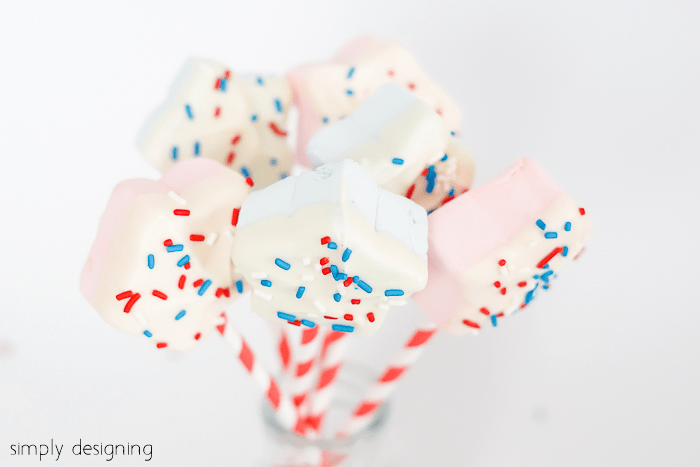 Yummy patriotic marshmallow pops & desserts. So. Cute. Love these, I am going to be making them with my kids! Thanks for sharing at Merry Monday! Have a great weekend!